As I mentioned in my previous post a lot of the projects on my list have to do with curb appeal. 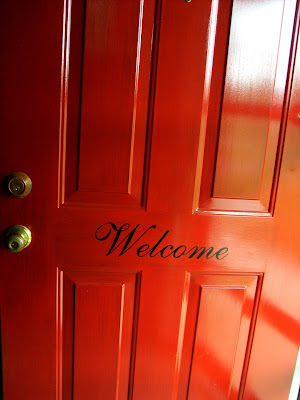 You only get to make one first impression so it's best to woo your buyers/renters from the get go. 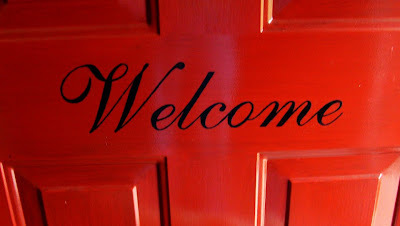 Long ago I stashed into my ever growing memory bank of crafty home projects, a door I had seen with a vinyl decal stating "welcome." I have been meaning to do that to my door but had never gotten around to ordering my decal. That plus I think they are slightly expensive for something that you don't have to spend any money on! So here is how I did it "for free" (insert Adam Sandler's voice as heard on "Bedtime stories"
1) print up your chosen word in your chosen font in your chosen size, onto freezer paper cut to fit in your printer (8.5x11) make sure you print on the paper side. Tape your stencil together as needed. 2) use an exacto knife to cut out your letters. Take your time to be accurate. Keep the little bits of paper that go inside letters as in the letter "o"
3) use a light spray adhesive and spray the back side of your stencil and your little paper bits that go inside letters. 5) burnish (rub) the edges of the letters with something dull but hard, like a crochet hook end. 6) use a brush and some paint to fill in the letter, you will only be able to do one pass because the paper will bubble a bit. 7) remove the stencil as sooon as you are done filling in the words. 10) clean up the "gunk"left by the adhesive with some goo gone using a q-tip. Be careful not to touch your paint with the goo gone. 11) you are done! Depending on what kind of paint you used you may want to spray a clear sealant over your words. I did not (yet) but I have a storm door so my door is protected from the elements. First I used the American Accents black gloss paint that you see in my "Kitchen table" post (coming up next) I did not like the results, it was to thin of a coat. So I cleaned it and used acrylic craft paint. It went on like a charm but then it dried to a dull finish, not what I wanted. So I went back over it free hand with the American Accents paint and I love the results! Of course this is just one way to do it. I just did it with stuff I had lying around. It would have been just as easy to cut the letters out of black contact paper, which seems to only exist online and not in any stores in Middle Tennessee. See that ugly lock set on the door? I have plans for updating it without spending any money as well! Looks great! Good luck with all of the prep work!